The Fourth District Court of Appeals has elected Marie Hoover as the Presiding Judge and the Administrative Judge for 2018. Fourteen counties in Southeastern Ohio comprise the Fourth District. These counties include Scioto, Pike, Ross, Pickaway, Highland, Adams, Lawrence, Gallia, Meigs, Hocking, Jackson, Vinton, Athens, and Washington counties. As the Administrative Judge, Judge Hoover shall be responsible for the administration, docket, and calendar of the court of appeals, among other things. In her capacity as the Presiding Judge, she shall call meetings as necessary for the purpose of discussing and resolving any administrative problems of the court; and she shall preside over the oral arguments before the court. Judge Hoover earned her B.A. in Political Science from Miami University in 1991. She then obtained her J.D. from the Ohio State University Michael E. Moritz College of Law in 1994. Judge Hoover was admitted to the Ohio Bar in November 1994. She has been admitted to practice before the United States Supreme Court; the U.S. Court of Appeals, Sixth Circuit; the U.S. District Courts for the Southern District of Ohio and the Eastern District of Kentucky; and the Commonwealth of Kentucky. Prior to joining the appellate court, Judge Hoover served as a Magistrate for Portsmouth Municipal Court, Law Director for Waverly, and Solicitor for Piketon. She has also been a contract attorney for the Ohio Public Defender’s office serving in Pike and Adams Counties. She had a private practice for approximately 19 years prior to being elected judge where she practiced in state and federal courts throughout Ohio and Kentucky. In 2012, Judge Hoover became the first female to be elected to the Fourth District Court of Appeals. She began her first term in office in February 2013. After being elected, her professional service has included serving as trustee for the Fourth District for the Ohio Women’s Bar Association. In 2016 and 2017, Judge Hoover served as a designee for Judicial Campaign Grievances pursuant to Gov. Jud.R.11. 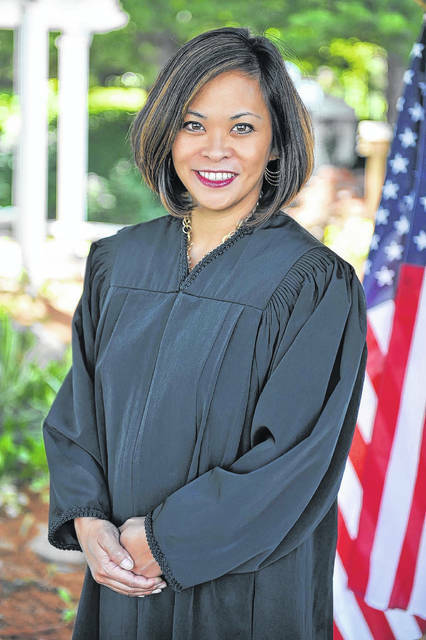 Judge Hoover is a member of the American Judges Association, American Bar Association, Ohio State Bar Association, Ohio Judicial Conference, Kentucky Bar Association, National Asian Pacific American Bar Association, Scioto County Bar Association, and Lawrence County Bar Association. Judge Hoover currently serves on the Criminal Practice and Procedure Committee and the Domestic Relations Committee for the Ohio Judicial Conference. She has previously served on the Court Technology Committee as well as the Appellate Practice and Procedure Committee for the Ohio Judicial Conference. Judge Hoover is also a member of the Ohio Association of Appellate Judges. Judge Hoover is a professor /adjunct faculty member for Shawnee State University. She has taught real estate law, business law, and probate, wills, and trusts law. Judge Hoover was elected as a fellow of the American Bar Foundation in 2017. She completed the Ohio Women Bar Foundation’s Leadership Institute in the Class of 2016-2017. She also attended the Appellate Judges Education Institute 2017 Summit under a full tuition scholarship. She is also a member of the League of Women Voters. During her time on the court, Judge Hoover has also sat by assignment in multiple appellate districts. She had the honor of sitting on the Ohio Supreme Court as a visiting judge by assignment of the Chief Justice in February 2017. Judge Hoover is joined on the court of appeals with Judges William H. Harsha, Peter B. Abele, and Matthew W. McFarland.